Spend your day with us browsing for traditional souvenirs and goods – made right here in Japan! Gain some insight to the foods and snacks that Japanese people eat and the typical items they use in everyday life. We’ll start the tour in the neighbourhood of Ningyocho, a district known for its old traditions and, as you’ll soon discover, some very tasty treats. We’ll visit a number of shops that have been around for over 100 years, many of which are still family-owned and operated and specialise in unique goods made right here in Japan. To kick things off, we’ll try some Ningyoyaki cakes, a true Tokyo specialty. This is a small sponge cake with sweet red bean filling, and made in different shapes. We’ll visit a bakery that has been around for 110 years, where the father and son welcome guests with open arms and enjoy sharing their knowledge about their cakes and craft. We’ll also visit two shops specialising in a specific traditional snack: senbei, or rice crackers. We’ll try sweet kawara senbei (made from flour, not actually rice), as well as salty rice crackers, a favourite in many Japanese households. One of the shops we’ll visit actually makes their crackers without milk or butter. From there, we’ll head to a local tenugui shop, where they sell woven hand towels depicting different traditional Japanese scenes. These towels are used for many things from wiping your hands to wrapping gifts, tea towels and decorations. Your Tokyo tour will next lead you to one of the eight shrines in Ningyocho. We’ll visit a shrine where virtue, longevity, learning and wealth are worshipped. You can offer a prayer here, and wash a coin to ensure a prosperous life. Once we’ve exhausted Ningyocho, we’ll visit another neighbourhood nearby, Nihonbashi. The district of Nihonbashi was a hub for merchants during the Edo period. Today, it is predominantly a financial district that houses trading firms and even the Tokyo Stock Exchange. And although Nihonbashi is very much a modern neighbourhood, it features many traditional Japanese shops hidden in its alleyways and even within its department stores. We’ll visit an old-fashioned stationery shop that was established in 1912. You’ll get to browse through the display of calligraphy brushes, inks, traditional paints, handmade greeting cards, and little dolls that tie into Japanese wedding and New Year’s customs. 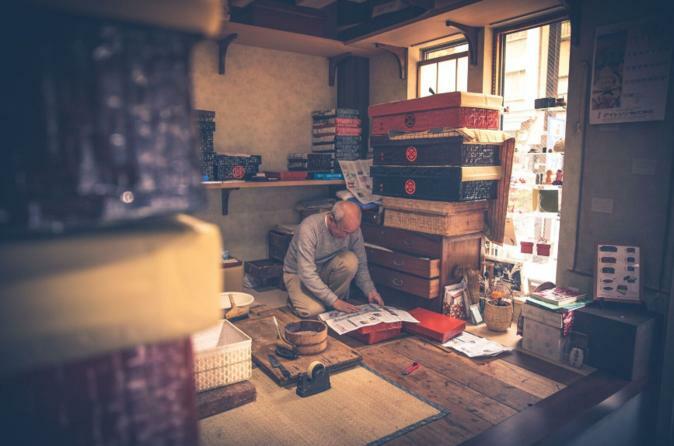 We’ll also discover a toothpick shop that has been in business since 1704, where you will be able to check out delicate handmade toothpicks, plus other handmade items carved from Kuromoji or Lindera umbellata trees.